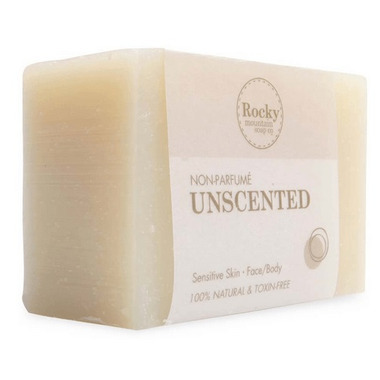 Rocky Mountain Soap Co. Unscented Bar Soap is a pure and natural unscented bar soap for extremely sensitive skin that is easily irritated. Completely unscented, this bar contains no added colours, herbs, essential oils or aromatherapy. This soap does not contain any synthetic foaming agents (such as SLS) that can easily irritate sensitive skin. This soap is also a great choice for camping as it contains no scents to attract wildlife or bugs. Skin type: Sensitive, Suitable for: Face, Hands & Body. Ingredients: Aqua (Water), Sodium Cocoate (Coconut Oil), Sodium Canolate (Canola Oil), Sodium Cottonseedate (Cottonseed Oil), Sodium Olivate (Olive Oil). GREAT soap. My current favourite. I am allergic to everything but not this! Excellent product for people who cannot use scented soap. Absolutely no fall out from this product such as itching or redness. I will use it again.